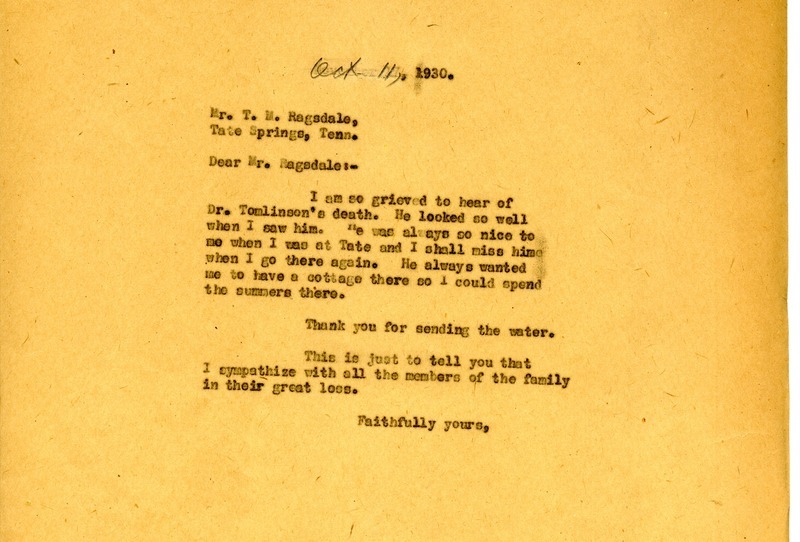 Martha Berry writes to Mr. Ragsdale to express her sympathy for the family of Dr. Tomlinson, who was always so nice to her when she went to Tate. She also thanks him for sending the water. Martha Berry, “Letter to T. M. Ragsdale from Martha Berry.” Martha Berry Digital Archive. Eds. Schlitz, Stephanie A., Chelsea Risley, Meg Ratliff, et al. Mount Berry: Berry College, 2014. accessed April 19, 2019, https://mbda.berry.edu/items/show/13783.